This recipe I got from my cousin's blog (En Vittu Virundhu) and I tried it adding few more ingredients. Here is the ingredients I used to make this pakoda. Basically Pakoda is a appetizer we make before a full meal. Also we can use this as a side dish (if nothing is there) for rasam rice or sambar rice. I made this for today's evening tiffin. First put the cauliflower florets in a microwave safe bowl and microwave it for 6 to 8 mts. till it becomes tender. Drain it fully and let it cool. 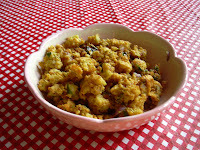 Now take a bowl, add rice flour, besan flour, salt, chillie powder, fennel seeds, curry leaves, asafoetida powder, onion and drained cauliflower and mix everything well. If necessary, sprinkle a little bit of water to it and mix. The mixture should be in kind of powdery and not watery. So careful while adding water to it. Now pre heat oil, sprinkle the cauliflower mixture and fry it till it becomes golden brown. Drain the extra oil in a paper towel and serve it hot with ketchup. Note:- While frying, be careful with curry leaves. Also this needs to be eaten hot. It may become spongy when its cold, then preheat oven for 5 mts. and keep this pakoda inside, then it will become crunchy to eat. All the best for your exams!! !